The self-proclaimed fact checkers, AltNews, funded by author Arundhati Roy who has ironically herself been caught spreading lies, got caught on the wrong foot again. 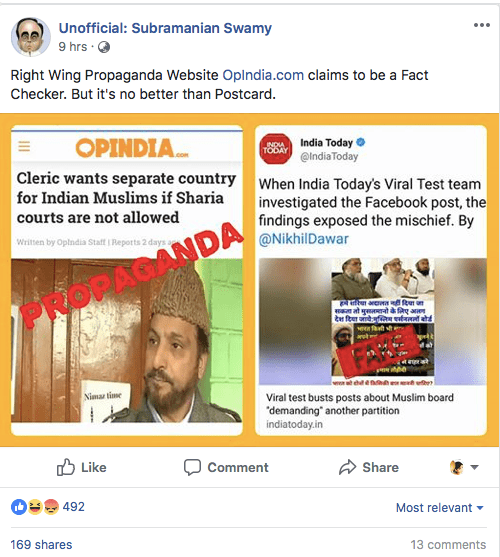 The co-founder of AltNews who runs a crass parody page called ‘Unofficial: Subramanian Swamy” resorted to spreading lies about OpIndia through his Facebook page. 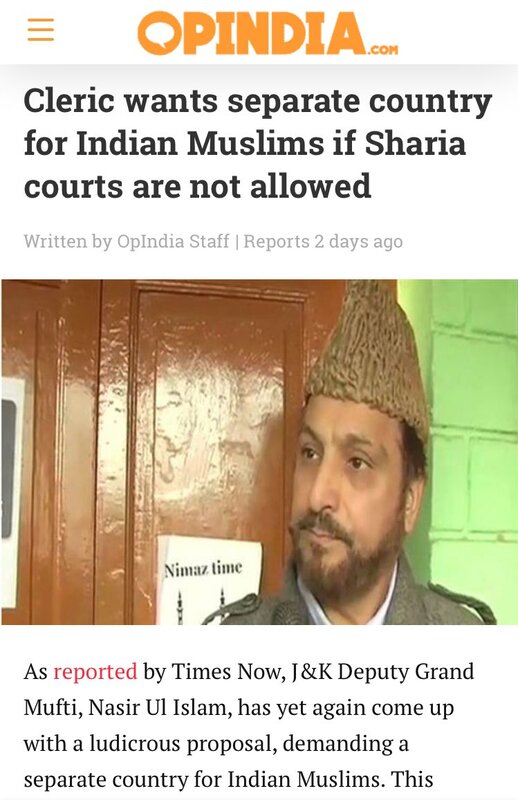 Recently, the AIMPLB had demanded that Sharia (Islamic Law) courts be opened in every district of India. This decision was met with stiff opposition from not only the ruling party, BJP but people at large. The Deputy Grand Mufti of Jammu and Kashmir had made an extremely controversial remark in this regard. He reiterated to various channels that if Sharia Courts were not allowed, then the Muslims of the Country should demand a separate nation for themselves. This was reported by us at OpIndia and the Deputy Grand Mufti of J&K making this statement on video to Times Now was embedded in this article. The co-founder of the alleged fact-checking website AltNews took to Facebook to call OpIndia’s report fake. As “evidence” to prove OpIndia’s report fake, the co-founder of AltNews attached a screenshot of an IndiaToday report that exposed the mischief wreaked by some Facebook post that had attributed the demand for separate nation to All India Muslim Personal Law Board (AIMPLB) and alleged, that the post face-checked by IndiaToday is the post OpIndia had reported. This, of course, couldn’t be further from the truth as the statement of the Deputy Grand Mufti of J&K reported by OpIndia was in fact also reported by IndiaToday. The same statement was also reported by IndiaToday. This blatant lie by the co-founder of the alleged fact-checking website, AltNews, was quickly called out by Netizens. This user branded AltNews ‘serial liars’. Look at this serial liar of @AltNews. Claims that OpIndia published a fake news. Some politely gave facts and asked the self-proclaimed fact-checkers to stop peddling fake news. 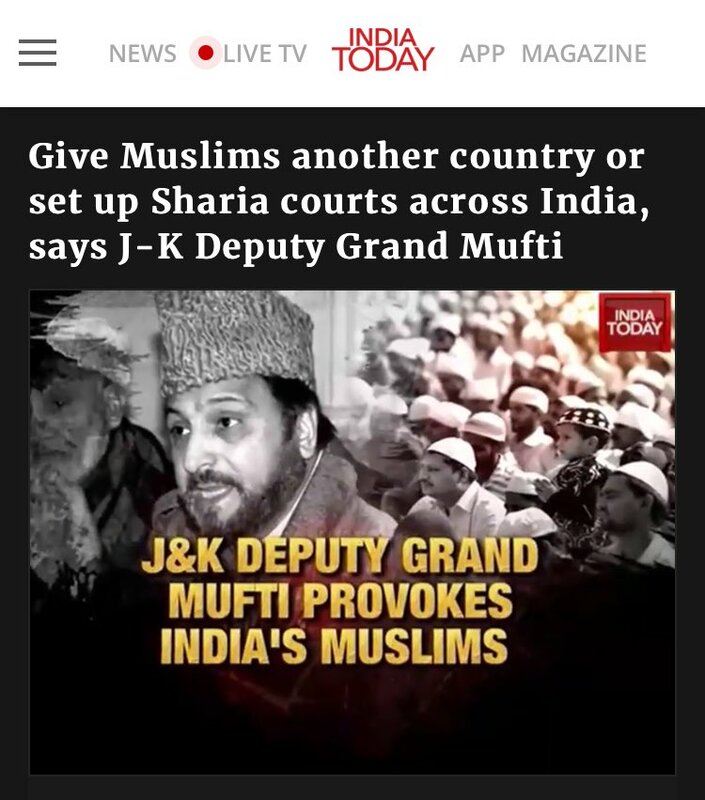 The @OpIndia_com news was about J&K grand mufti which was also published in @IndiaToday (link: https://t.co/TpqaZr341P) The India today image you have shown is for AIMPLB. Get your facts correct and stop peddling fake news. Others questioned their “fact-checking” capabilities that they choose to propagate. And some mocked “susu swamy”. Incidentally, something he calls himself. Well, how can we argue with the name he gives himself. Ek @swamv39 hi sach bolta hai baaki sab jhooth ??? The reference to ‘Zubair’ in some of these tweets is regarding reports that the said Facebook page is run by a person called Zubair, who has Islamist tendencies and uses social media to attack Hinduism and Hindutva. OpIndia can’t verify these claims made by social media users, and we will like to endorse only the part where lies of this man – whether Zubair or someone else – are being called out. This is not the first time that AltNews and Mr SuSu have been caught in their lies. Earlier, AltNews had resorted to slandering a veteran army officer and were promptly called out. They had also tried their hand at some fancy “voice analysis” to prove that no anti-national slogans were raised in Bihar. Their claims were busted by Bihar DGP himself. Mr ‘SuSu’ had also shared a fake image of BJP leader BSY Yeddyurappa before the Karnataka Elections. Mr SuSu had also peddled a protest march picture from Maharashtra as one in Delhi and was later forced to retract and apologise. SuSu had also confused FDI in single brand retails and multi-brand retails.